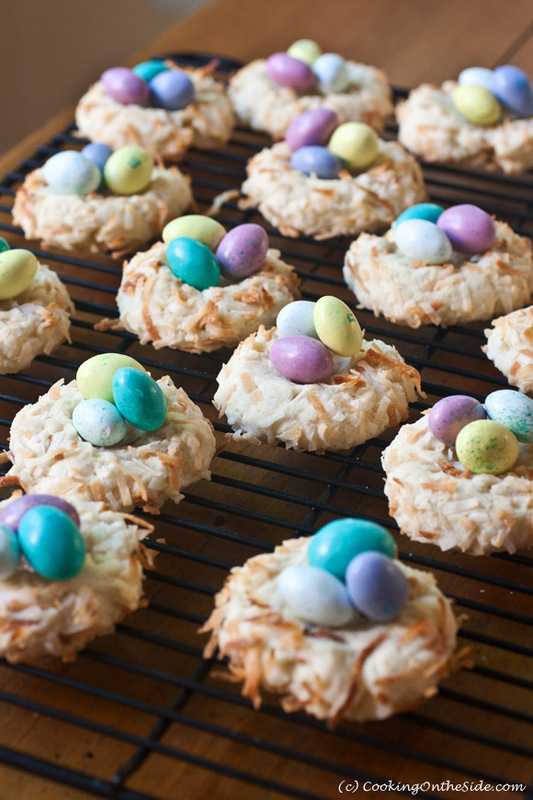 Believe it or not, these Easter Bird’s Nest Cookies actually appeal more to grown-ups than to kids…at least according to my non-scientific research earlier this week at our annual playgroup Easter egg hunt. 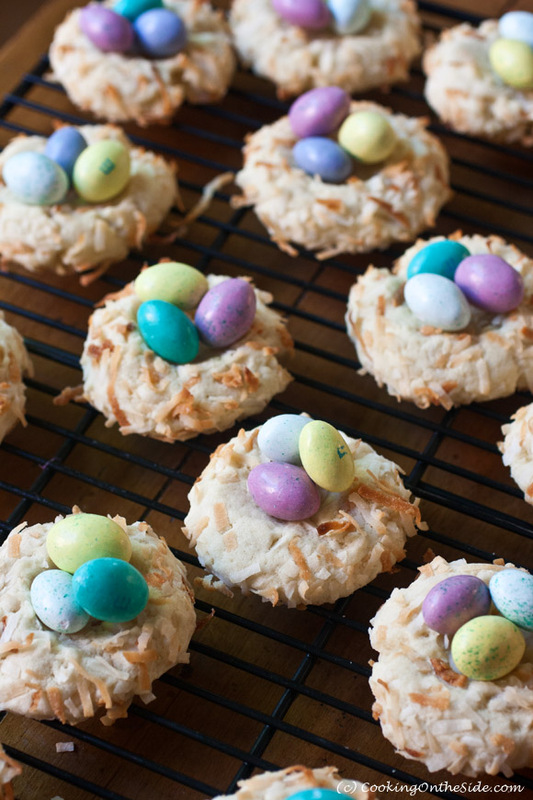 While the kids mainly honed in on the little candy-coated chocolate eggs, my friends found themselves grabbing for seconds of the not-too-sweet toasted coconut shortbread nests. One more thing to note about these cookies: they’re a little unusual in that the shortbread is essentially a bowl you fill with the candy. The eggs rest inside each nest, but aren’t affixed to it, so if you’re transporting them to a get-together (as I was) your best bet is to bring the candies separately and fill the nests once you arrive at your destination. Preheat oven to 300°F. Spread coconut on non-greased cookie sheet. Toast in oven, stirring occasionally, until it turns light golden, about 25 minutes. Remove coconut from cookie sheet and set aside. Increase oven temperature to 350°F. In large bowl, add butter and sugar and whip until light and fluffy; beat in egg and vanilla. In medium bowl, combine flour and salt. Blend into creamed mixture. Form dough into 1-1/4-inch balls. 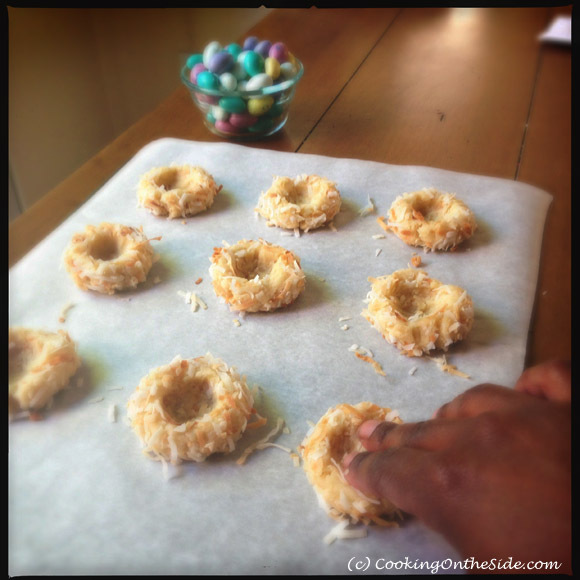 Roll heavily into toasted coconut. Place coconut cookies 2 inches apart on lightly greased cookie sheets. Make indentation with thumb in center of each cookie. Bake 12 to 14 minutes or until golden brown. Remove cookies and cool completely. Fill indentations with M&M’s® Brand Speckled Milk Chocolate Eggs.